CENTCOM began moving its forces on August 7th, marking it as C-Day. Many units based in the Southeastern United States had CENTCOM roles and had been quietly preparing for possible movement overseas since the invasion began. Consequently, the orders to begin moving came as little surprise. By August 8th, the first ground troops of what would ultimately be a 540,000 thousand soldier effort were on their way to Saudi Arabia with orders to be prepared to fight as soon as arriving in the Kingdom. 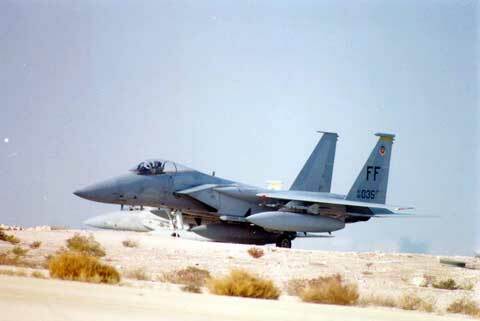 The first unit movement of Desert Shield began with F-15s from the 1st Tactical Fighter Wing based at Langley Air Force Base, Virginia and elements of the 2nd Brigade of the 82nd Airborne Division from Ft. Bragg, North Carolina. The F-15s traveled across the Atlantic, refueling in the air multiple times and began landing at Dhahran Air Base on August 8th (C+1). 2/82nd Airborne was not far behind, also arriving at Dhahran and immediately establishing defensive perimeters around airbase and nearby port for the arrival of follow on forces. The first soldiers on the ground recognized how exposed they were. If Iraqi tanks crossed the border and came south, the fight would be short. The F-15 pilots greatest concern for the first two days in the Kingdom was ordnance. Their fighters only had enough air-to-air missiles for one engagement. Two at the most. The paratroopers of the 82nd had an even greater dilemma. Iraq’s units in Kuwait at the time were armor heavy. The 82nd was, in essence, a light infantry unit. Consequently, it had very little anti-tank weaponry. Until a sizable number of ground forces arrived in theater, CENTCOM commanders were keenly aware that air power alone was going to have to deter Iraq. By C+2 the first squadron of F-15s to arrive in Saudi Arabia was ready to conduct combat operations despite the shortcomings with ordnance. Within a week of C Day there were five USAF fighter squadrons in Saudi Arabia with even more on the way. After the arrival of the first five squadrons there was a delay before more could be sent. Airlift assets were shifted to ensure the movement of the rest of the 82nd Airborne to the desert. The fighters could self-deploy, however, airlifters were needed to transport the squadron support personnel, munitions and supplies. Without these crucial elements, the fighters themselves were essentially useless. In the absence of additional fighters, twenty B-52Gs arrived on the island of Diego Garcia in the Indian Ocean. In the first week of Desert Shield Military Airlift Command (predecessor of current Air Mobility Command) apportioned its entire fleet to the effort. CENTCOM had a lot of units to move and immediately put them to work. On August 11th (C+4) the Civil Reserve Air Fleet was issued orders to prepare for authorization. A limited number of civilian airliners and cargo planes had already been volunteered by their companies and were augmenting the MAC airlifters. Aircraft were not the only form of transportation. America’s sealift capability was mobilizing, with the assets closest to the region moving on C Day. On the island of Diego Garcia, Maritime Prepositioning Ships carrying the equipment of a full Marine Expeditionary Brigade and enough supplies to sustain it for 30 days had slipped their moorings and were steaming west towards the Persian Gulf. The Marines of the 7th Marine Expeditionary Brigade would marry up with the equipment were preparing to fly to Saudi Arabia. Similar in concept to the MPS vessels, the Afloat Prepositioned Ships carried weapons, supplies and fuel for Army and Air Force units also left their anchorages at Diego. They proved their worth. The first MPS ship arrived at Dhahran on the 14th of August (C+7) and the first APS vessel made port on the 17th (C+10). Ground forces were what would be needed to stop Iraq’s forces if they invaded Saudi Arabia. Airpower and naval power would slow them down, however, troops were needed on the ground. As the 82nd Airborne Division deployed, behind it was a queue of forces preparing for their turns to move to Saudi Arabia. The 24th Mechanized Infantry Division was the most critical element. It was an armor heavy division, essential for defending against Saddam’s own tank heavy forces. On August 9th (C+2) it’s lead elements were moving from Fort Stewart to its embarkation port of Savannah, Georgia where fast sealift ships were gathering to move the division’s heavy equipment to Saudi Arabia. The vanguard of the 101st Airborne Division had begun moving two days earlier. In spite of the rapid movement, both divisions would fully arrive in theater until late August or early September. With it becoming apparent that the United States was resolutely determined to defend the Saudi kingdom from the threat off to the north, how Saddam reacted was anyone’s guess. The US was forming a wide coalition of nations, diplomatically attempting to isolate Iraq and force it to withdraw peacefully from Kuwait. US and allied naval forces were conducting operations in the Persian Gulf and Red Sea, enforcing the embargo set upon Iraq by the UN. Time remained on his side, however, the window of opportunity to invade and conquer Saudi Arabia was beginning to evaporate. Every day the forces arrayed against Saddam Hussein were growing stronger, while his troops in Kuwait sat aimlessly, awaiting orders to either continue south or begin digging in. Next Post: China’s Shifting Nuclear Posture: An Ominous Sign Of Things To Come?